Often times, when speaking about unique areas of Disney theme parks, we gravitate towards Epcot’s Future World, Tokyo DisneySea, New Orleans Square tucked away at Disneyland, or the Discoveryland of Disneyland Paris. The Magic Kingdom of Walt Disney World, draws in hearts and minds, but is seldom looked too for its uniqueness. Yet, the Magic Kingdom is host to an entire land that exists nowhere else on earth, Liberty Square. Liberty Square’s life began many years before Florida’s groundbreaking, back West at Disneyland. Liberty Street would move off from Main Street U.S.A. portraying the lives and times, as well as architecture, of the thirteen original colonies. Situated in the heart of this capsule of dramatic upheaval in American history would be an Audio-Animatronics show featuring the presidents of the United States. This show would eventually be scaled down and turned into the walking and talking Abraham Lincoln for the 1964 World’s Fair. Though it would never come to Disneyland, like all good ideas, Liberty Street was remembered and included in the original plans for Walt Disney World’s Magic Kingdom, and it would include another Disneyland staple, the Haunted Mansion. By the time the park opened in October of 1971, the Haunted Mansion had gained a ghastly facade, Lincoln had been joined by his colleagues, and the riverboat had a new landing place in Liberty Square, rather than Disneyland’s Frontierland. While each of these attractions had some tie to the original park, they were only the draw to bring guests into Liberty Square. Unique shopping, music, and photo opportunities (let’s be honest, who hasn’t done the stockade photo?) give the land a life of its own. Aside from fun and food, Liberty Square brought with it several areas with which guests are able to take pause and marvel over what has happened in the United States that has brought us forward to today. The Liberty Tree, the grand oak complete with its thirteen lanterns, symbolizes the public meeting spaces that young men and women gathered under during Revolutionary times to contemplate the struggles, both internally and those fought on the battlefields, they would face. The Liberty Bell, the only replica to ever be cast from the original Liberty Bell molds. 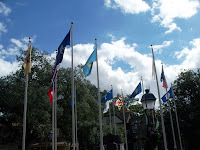 Surrounding the Liberty Bell is a courtyard of flags, where the flag of the United States and the flag of each of the original colonies stand. Included beneath each flag is the name of the colony and the date the state ratified the Constitution. Around every corner of Liberty Square there is something to see, experience, or learn. Two if by sea lanterns, lashed shutters, period crockery and pots, the possessions of the might, yet, humble servants known as the Presidents of the United States, and the charming architecture of the bygone eras of Philadelphia, Boston, and the Hudson River. What once seemed fresh has faded into history, and like that history, our perceptions of Liberty Square have diminished with time. This wonderful corner of the Magic Kingdom contains so much of the history of America and the history of the Disney theme parks, it pays its respects to another age while creating new experiences, and it a unique area that is deserving of the time and curiosity it takes to appreciate it.